I've been learning more about my camera - about photography in general. F stops and ISO's and apertures - the big 3. I put my camera on Manual today and experimented - and I have to say that I like the pictures better when I set the parameters myself than when the camera decides - on the auto settings. First up, some flowers. Remember to click on the picture to "embiggen" it - they look much better that way!! Technically, these are not flowers (the flowers are tiny light purple ones), but berries. 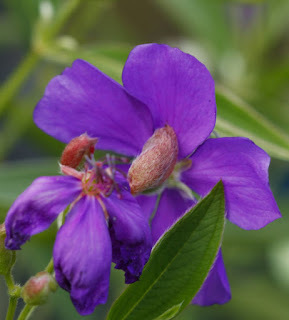 This is one of my favorite plants because it's native to Florida, the birds like to eat the fruit, it's easy as pie to grow and it's berries are the most beautiful shade of purple. I wonder if they are poisonous - if not, can they be baked in a pie? Hmmmmm. I'll have to look that up. 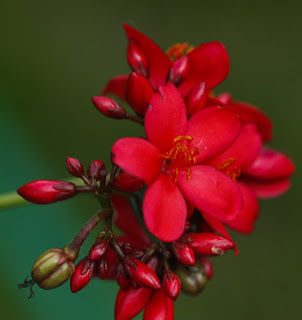 Jatropha, another butterfly plant - not a larval plant, I don't think, but a food plant. 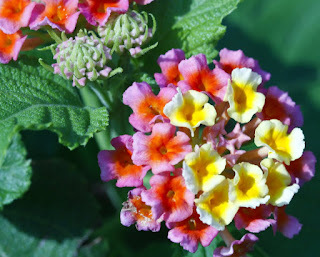 This is light colored lantana. I also have the bright orange and yellow version which I like better. 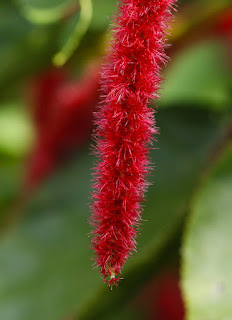 This plant is definitely a butterfly food favorite. This is the luscious purple flower of the Glory Bush - another butterfly bush, although I don't often see them on it. Who cares anyway - it's purple!! Now for some polydamas caterpillars. 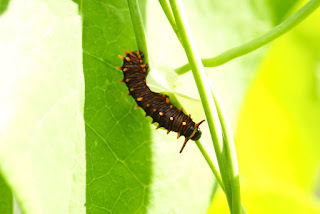 I'd like to show you the butterfly, which is a swallowtail and is mostly dark brown/black with yellow edging on it's wings, but I was only able to photograph the caterpillars, and we have a LOT of them. They like Dutchman's pipe, a vine. I haven't seen any of the distinctive flowers on our Dutchman's Pipe vines, yet, but the Polydamas butterflies seem to recognize the plant without the help of it's flowers. You can see a big fat one, probably not long before it spins it's cocoon and one a little smaller. 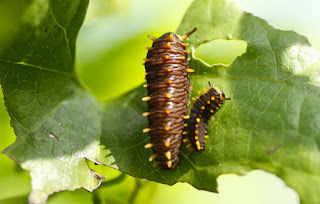 Every time they get too big for their skin, they shed it and each size up is called an Instar. 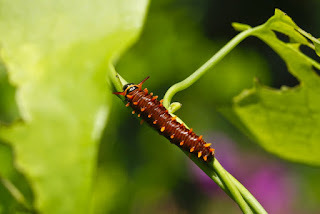 The First Instar is tiny tiny, and I think the Fifth Instar might be the last before cocooning, but I'm not sure. "Hey!! 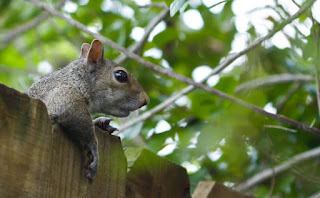 Got any peanuts?" 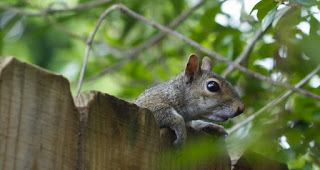 Mr. Squirrel seems to be saying as he peeks over the back fence at me below. Once he realizes I'm not coming any closer, he gets comfortable and looks like he wants to gossip awhile. Here are a few butterflies I WAS able to capture. 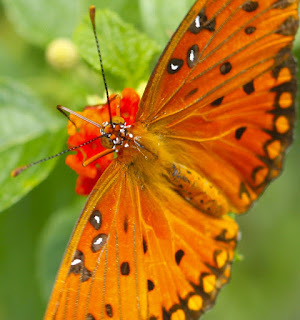 First is a Gulf Fritillary on Lantana. You can just about see it's Proboscis stuck into the innards of the tiny flower. 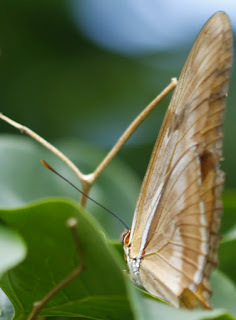 Next is a Julia - I'm not sure if this is a Female or a Male. 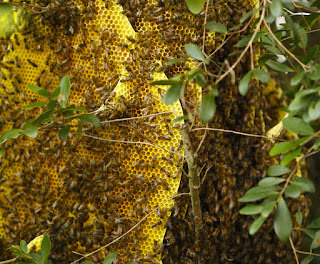 As I have written in past posts, we have a feral honey bee hive in our backyard. Here are some photos that show both some capped areas of the comb (babies inside or honey locked away?) and some areas that clarly have shiny liquid honey in them. The capped area is small and is on the bottom of the picture toward the left. The honey is at the top of the picture in about the middle. Beautiful photos! You are getting good at that! I think that is American Beauty Berry which means it is not good to eat, but the early pioneers used it for dye so get some wool and change its color! Thanks!! Yes - it is American Beauty Berry - I bet it would make a GREAT dye - I've been experimenting with tie dye and indigo - why not Beauty Berry? ?